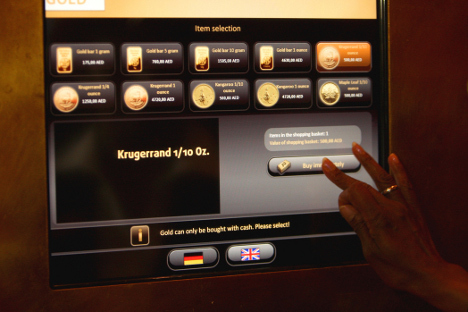 The Emirates Palace hotel in Abu Dhabi, UAE, has unveiled a gold vending machine. The vending machine operates like any other vending machine. Select a product and put the required cash in the machine, and out slides your selection. Customers can choose from gold bars weighing up to 10 grams or well known gold coins such as the Perth Mint Kangaroo and the Maple Leaf coins of Canada. The machine operates real-time product prices and dynamically adjusts prices at 60-minute intervals at the ATM. 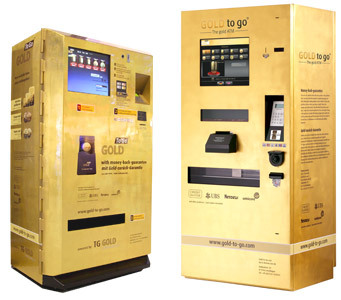 The machine has been developed by GOLD To Go, and there are plans for more locations in the future.